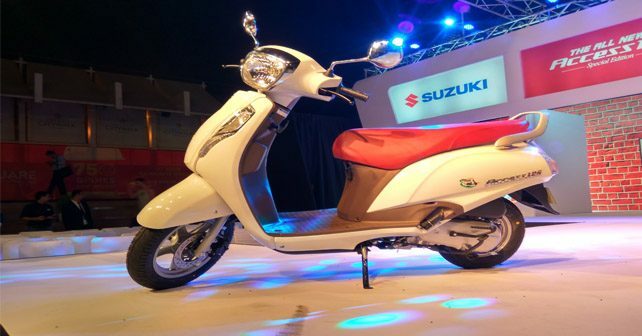 Suzuki Access 125 Special Edition launched, flaunting a retro-classic theme. Suzuki Motorcycle India seems to be on a 'special edition' launch spree of late. Only a few days ago, the company introduced Gixxer SP range, and now it has given a similar kind of treatment to its Access 125 scooter. To help push sales of the Access 125, Suzuki has introduced a special edition variant that flaunts a retro theme and a snazzy colour combination. Updates on the new edition include round-shaped chrome-finished ORVMs, maroon leatherette seat, brown coloured floorboard and special edition badges scattered around the bodywork. It will only be available with a Pearl White shade. Apart from this, the scooter remains unchanged from the regular Access 125. Which means you still get the same features and equipment as the standard model. On the mechanical front, the Access 125 Special Edition does not get any updates, meaning it comes powered by the same 124cc single-cylinder air-cooled engine that is rated at 8.58bhp and 10.2Nm. Sending drive to the rear wheel is a buttery-smooth CVT. The powertrain has an ARAI certified fuel economy of 64 km/l. Like the standard model, the special edition model is also available in disc/alloy wheel or drum/steel rim variant. Telescopic forks are standard upfront. Commenting on the occasion, Satoshi Uchida, Managing Director, Suzuki Motorcycle India said, "The Access15 has been one of our most successful models. We have enhanced the fashion quotient and introduced the Access 125 Special Edition to diversify our presence in the segment and cater to the evolving needs of our customers. The Access 125 Special Edition is an indivisible combination of substance and style which gives it a retro feel and make it stand out in the crowd." The Suzuki Access 125 Special Edition is priced at Rs 55,589 for drum brake variant while the disc-equipped version is for Rs 58,900 (both prices are ex-showroom, Delhi). The Access 125 primarily competes with the Honda Activa 125.